Westfield, (NY) – To start. What is the most popular wine in France? Today, it is rosé. In fact, since 2008, sales of rosé wines in France have actually been higher than sales of white or red wines. Twenty years ago in the United States, rosé was thought of as a light, pink, sweet “beach” wine. Today, more sophisticated rosé wines, often on the dry side, are experiencing a burgeoning popularity in the United States, amongst both Millennials and general wine drinkers – just as in France ten years ago. Imports of French rosé wine to the United States increased 58% in 2015 alone – and over the last fifteen years have risen from a mere 158 thousand liters in 2001 to 7.800 million liters in 2015. In early May, just as spring was struggling to arrive in western New York, Johnson Estate’s winemaker, Jeff Murphy, confirmed that the winery’s most recent Dry Rosé was ready to be put on the shelves. The rich ruby color of this wine positively glows in its clear glass bottle. In addition, the bottle has a tempered glass cork – a pale pink re-sealable Vino-lok glass cork - which is also popular in Europe for rosé wines. Johnson Estate’s 2017 Ruby Dry Rose was made from estate-grown Maréchal Foch grapes which were picked when fully ripe. The juice was “bled off” just an hour or so after the grapes were picked and the remaining grapes were used to make our traditional Maréchal Foch varietal wine. Thus, this light and fresh rosé juice has not been through the press nor is it fermented with grape skins. This traditional process of making rosé wine is called “the saignée method”. The resulting crisp, ruby-colored wine has an aroma of strawberries and cranberries and a velvety and full mouth-feel redolent of raspberries. Strong elements of fresh fruit and very light tannins result in the perfect summer wine. 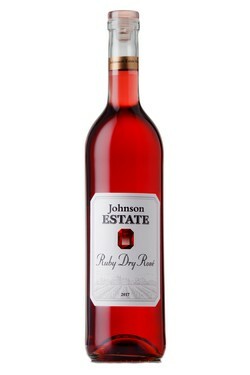 Johnson Estate’s Ruby Dry Rosé joins a portfolio of award-winning dry, semi-dry, and sweet wines made from both classic vinifera grapes (Riesling, Chardonnay, Pinot Noir, and Cabernet Sauvignon) as well as younger French varietals (Maréchal Foch, Chambourcin, Seyval and Vidal Blanc, and Chancellor). Johnson Estate Winery, with 115 acres of vineyards, is the oldest estate winery in New York State and a founding member of the Lake Erie Wine Country. 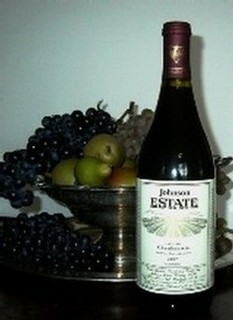 For more information please visit www.johnsonwinery.com, or www.facebook.com/johnsonwinery, or call 716-326-2191. "Bud Break" announces the start of a new growing season in the vineyards - a new vintage begins. Will there be enough heat-light units to finish the race at harvest with gold medal quality grapes for the year's wine? Or will we come up short, with grapes insufficiently ripe to make the best wines? and extra sunny days to arrive at harvest in "medal form" this year. Thanks for getting me up so early Thursday morning. The stars were sparkling over the vineyards as I tromped through knee-deep snow hoping for an early harvest. Each winter, we watch the long-range weather forecasts to see when you will bless us with several "cold-enough" days (that means 12-15 degrees!) to crystallize the juice in the grapes we net for ice wine. Earlier this week, it began to look promising, and we'd sent out the "Ice Wine Harvest Alert" to all our hardy volunteers. So, on Thursday, well before dawn, I stopped in the midst of the snowy Chambourcin vineyard to check on the state of the grapes set aside for ice wine. When I popped a grape berry into my mouth, it was slushy.....but not yet crunchy. A no go......not cold enough. Then I had to text the volunteers: "stay in bed!". So, back to watching your weather. In the meantime, and for all of the regular folk too, here's a link to an article on ice wines in the most recent issue of Edible Western New York. Publisher, Stephanie Schuckers Burdo, was with us last December and took that photo of me hauling a crate full of Chambourcin; then she put the camera down and helped with the harvest! After attending a trade show in Montpellier, we travelled to Avignon, the small French town set upon a hill in southern portion of the Rhone Valley where the “Pope’s New Castle” was built in the thirteenth century. It housed eight popes over the course of 70+ years before the Pope moved back to Rome. But it was the popes of the era who first encouraged the growing of grapes and the production of “vin du Pape” in the nearby countryside. Chateauneuf du Pape, where we traveled during much of our visit to France, is one medieval village located near vineyards, some of which are over 100 years old. The Appellation d’Origine Controlée for Chateauneuf du Pape was established in 1936 and fifteen varieties of grapes are allowed to be planted in the appellation. Grapes must be hand-picked to make the approved appellation wines (sometimes with stems, sometimes not). Today the area with roughly 6,000 acres of vineyards has about 250 growers/wineries. Grenache is by far the most popular grape variety planted in the region (roughly 75-80%), along with Mourvedre, Cinsault, and Syrah. –In old vineyards, these varieties might be mixed to provide field blends, but today are often used to blend the famous red fruity, lush wines of the region which are very drinkable young and may also be successfully cellared. Only five percent of the region’s production is white wines – from Roussane and Grenache Gris – but these more rare white wines were some of the most interesting which we sampled during on our visits to several of the regions wineries. We use the word “terroir” to describe a wine region’s climate, geology, and wine culture. Most of the wineries we visited had educational “displays” of the terroir of the region, illustrating the importance of terroir and the differences amongst the wineries in the Rhone Valley Yes, in sometimes cases, the displays were very elaborate set-ups in which a winery would display “dirt” - the soil, sand, clay, and stones/pebbles characteristic of different vineyards. Old vineyards were a source of pride and are pruned very short to protect them from the “mistral winds” which are an integral part of the region’s terroir – which is otherwise features sunny, hot, dry Mediterranean summers and mild winters. BUT, we will say that during our visit, that the region had its first snow in ten years! It was not what we were expecting! We were very impressed with the size and quantity of the concrete tanks we saw in this region. Fermentation occurs in these tanks as well as in stainless steel ones. And aging, of course, done in large even giant, French oak barrels. Cheese and sausage!!! Every meal, it seemed, came with a cheese and charcuterie board, with soft cheeses, like Brie, predominating.